In our push button, turn-key, remote control world, it is easy to forget that not long ago in order to cope with our world, we made constant physical contact with it. The strength and agility of our hands, arms, backs and legs had to be brought to bear, or the struggle to survive would be over. As a result, hand held implements, as extensions of our physique, were carefully crafted forms with long lineages of trial and error. In the wet, slippery, sliding, surging, shifting, wriggling world of maritime life, with the need to muckle on and not let go, hooks of many sorts have been indispensible. I pay tribute to this gang of doubled-back helpers with this gallery of well-known favorites and some obscure surprises. Let's play hooky! Every lobster landed on the coast of Maine begins its journey to your plate when a gaff hook held by the lobsterboat operator snatches the warp that tethers the submerged trap to its floating buoy. For a few important seconds, the gaff lifts the dripping line out of the water within reach of the trap hauler pulley, around which it is wound; the drive is then engaged to hoist your dinner up to the light of day. 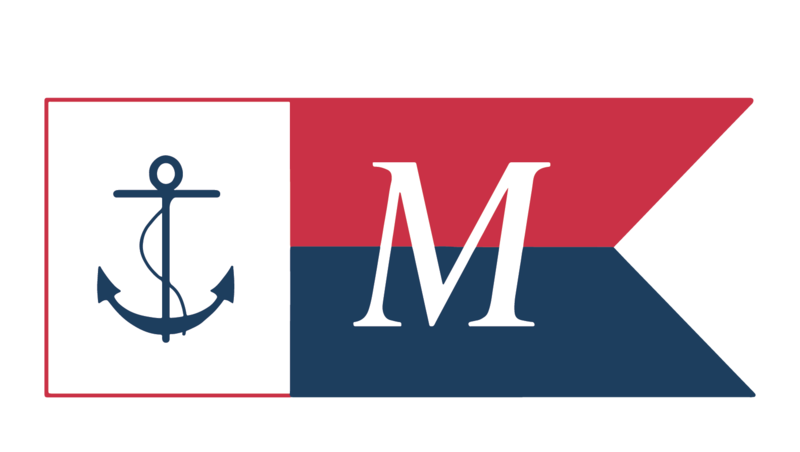 This particular gaff (front) is a commercially made version, from the Harris Co. marine supply outfit in Portland, Maine. The pop-rivetted aluminum mounting is simply a modern version of a traditional twine wrapping around the hook. The lobsters are still the same as ever. The cast bronze double-headed boat hook (back) doubles the chances of snagging your target; its extra heft more likely placed it aboard a pleasure boat. 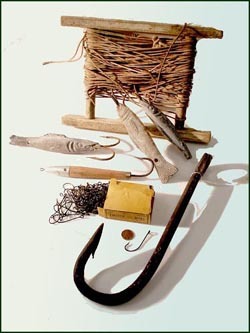 A medley of that well-known barbed shape, the basic fish hook: twin-hooked cast-lead fishes that double as lures and sinkers for a hand reel cod-line; a wooden lure with silvery head to tempt bluefish or striper; an original box of unused Limerick hooks sized for, say, flounder; and, noting the penny for scale, the same identical pattern, sized up for shark. 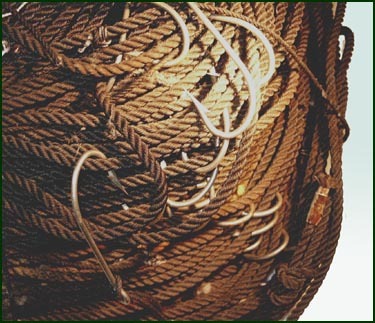 A 20th century halibut longline, as coiled before baiting. The main line is synthetic, and 1/4" thick; strung on short leaders spliced to the main line, the hooks are stainless steel and about the size to loop around, and hopefully not into, the end of your thumb, as they are paid out over the gunwale. The New England longline fisheries for halibut, haddock, and cod were virtually extinct by 1980 as draggers with their nets became predominant. 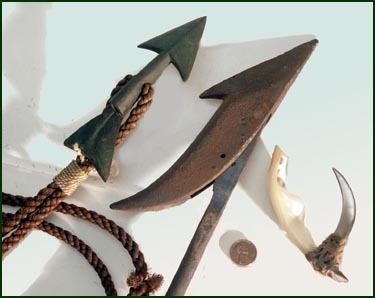 Three highly specialized hooks: (from left) a bronze sword-fishing dart, designed to break away from a wooden shaft mounted in the dart's tail socket once implanted in the big fish; a whaling harpoonwith a swiveling head that will lock sideways in the blubber as the whale pulls away (note the small hole through which a piece of twine is tied to keep the head aligned before striking); and a Polynesian fish hook, brought to Boston from the South Seas in 1847, reported to have been found in the stomach of a shark. Two carefully shaped shell fragments have been joined with a fiber lashing that is still remarkably intact. The reflective shells serve as a lure; the exquisite artisanry of this piece is almost jewelry-like. 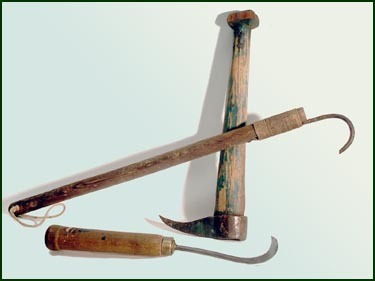 Two spear-heads of a type used to catch eels in the five rivers that flow into Merrymeeting Bay: Kennebec, Abagadassett, Cathance, Androscoggin, and Muddy. The hooks kept the wriggling eel from slipping off, once impaled. 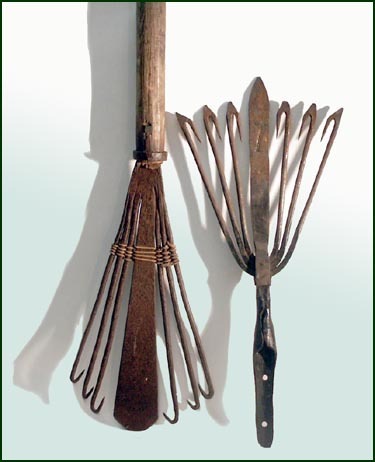 These shellfish tongs with the moving tines represent a whole range of hooked and pronged devices in the collection that reach below the water to snag mussels, scallops, clams, oysters, Irish moss, rockweed, dulse, kelp, etc., each carefully configured to best extract their diverse quarries. 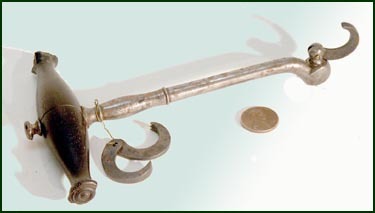 At right, a pelican hook has a lever that opens in a related way to create a strong but release-able linkage, for the stay of a mast, for example. 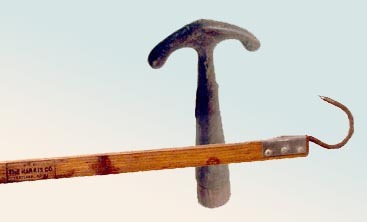 Although this pick pole (front) resembles a cousin used on log drives, it was made by the Gifford Wood Co., purveyors of tools for the wholesale ice industry, and undoubtedly used for guiding frozen blocks of Kennebec River ice from where they were sawn out of the river, up the lifts and into the enormous storage houses. The ice tongs (behind) were used more on the retail end, handling single block ice from delivery wagon to waiting household icebox. 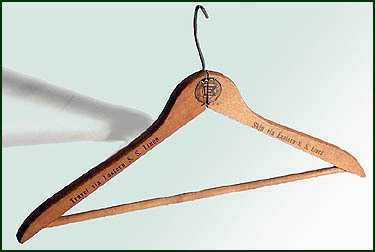 The thinner single hook was used by stevedores to handle bales of jute, hemp, or cotton; the thicker one is a pulp hook, for stacking small diameter, four-foot wood-pulp logs, or firewood of any size. Often used in pairs, pulp hooks wielded by an expert are a sight to behold. 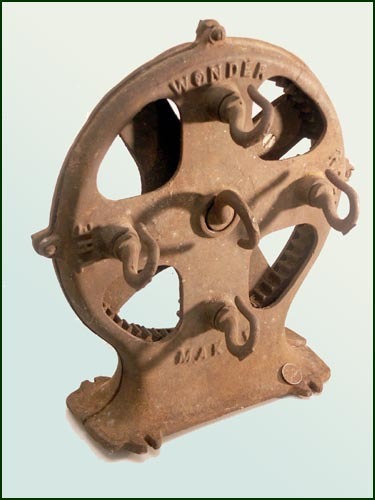 Four outer hooks spin as the center hook of "The Wonder Rope Maker" revolves. Though the action is hypnotic, one is left wondering just how long of a rope-length could really be spun with this device. While most laid-up rope has three strands, less elastic four-strand rope was used in specialized situations. Sometimes the devices that survive are the ones that are failures, thrown onto a back shelf in disgust, and forgotten about. The heavier handle with hooked head forms a pickaroon, which was brandished one-handed around timber-yards and sawmill brows to nudge wayward logs into final position. The fish gaff lashed to the looped handle comes from the equipment used aboard the fishing schooner Sherman Zwicker, used to pick fish from dory to deck and down to the hold after cleaning. Like any tool used repetitively, it is simple, light, well balanced, and easily repaired. 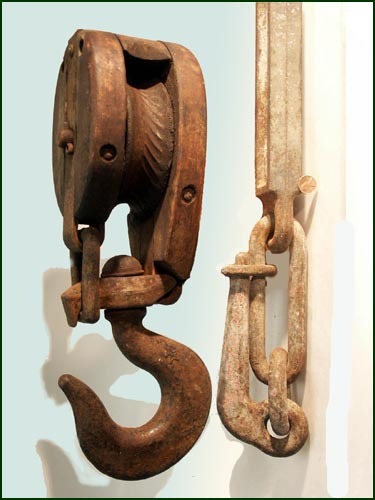 At bottom is one version of the common boatyard reefing hook, common at least when boats actually had seams and the accompanying need to periodically reef out and replace the old caulking. Other versions of these have a thickened hook that can withstand mallet blows. 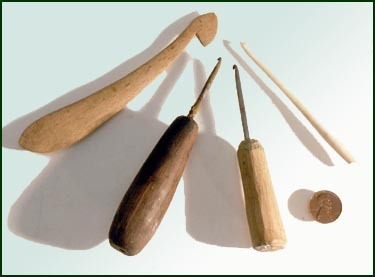 Four diminutive cousins: (from right) an ivory crotchet hook, in the use of which many a bored mariner was diverted in the off-watch hours; a metal version from a sort of repair kit used by Captains John and Fessenden Chase, which included shoe repair gear; another similar hook from the miscellaneous tools of Bath boatbuilder Charles E. Blaisdell; and a tool carved of maple for repairing fish-netting, which is hooked up in crochet-like knot-work. You say coat hanger, I say coat hook. While dating coat hooks is fraught with peril, suffice it to say that Eastern S[team]S[hip] Lines emerged in 1914 from the bankruptcy of the original Eastern Steamship Co., founded in 1901. World War II would end the New Brunswick-to-Norfolk reach of this passenger service empire. Post-war service survived with a single Boston to Yarmouth, Nova Scotia route until 1954. If the company could still afford stateroom coat hooks by then, this one may date as late as that. I hope it is becoming evident that "a hook" in maritime culture could be many things. 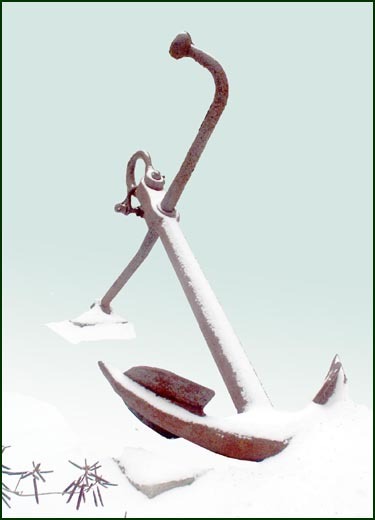 "The hook" to a mariner could only mean that most crucial piece of equipment, symbol of steadfastness, saviour in times of peril: the anchor. 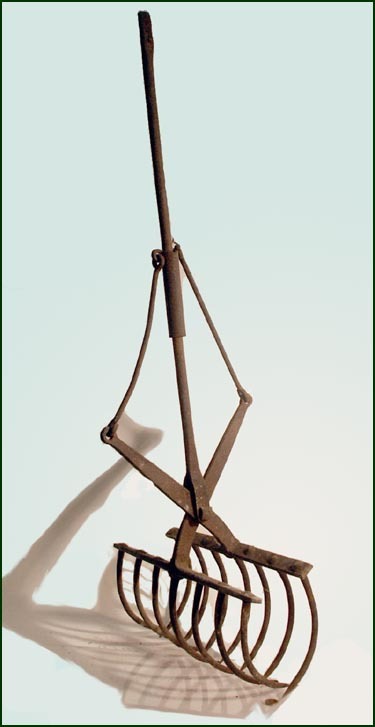 Spanning the technological spectrum: on the right, a killick, or home-made anchor using a specially selected killick-stone wedged into a natural-grown tree fork; on the left, what the killick became, one of numerous patent anchor designs. This one is aptly marketed as the "Silver Talon", which posesses something billed as "Automatic Reaction." 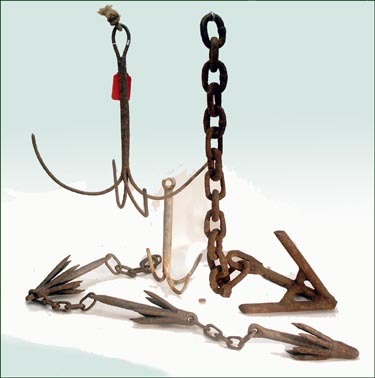 At left with red tag: an all purpose grapple for lightweight underwater searching, as for missing lobster traps, lost moorings, drowned bodies, and the like. At right and below: a variety of grapnels or lighter anchors associated with the dories from the fishing schooner Sherman Zwicker, used to anchor these smaller boats to the shoals of the fishing ground. Such temporary anchors were made to light enough to pull free relatively easily as the boats moved about tending their lines. Waiting at home were women and children with serious button issues, who were serious wielders of button hooks. Shoe buttons of ca.1900 fashion were too small to be grasped by fingers, but behaved when under the hook, as it is slipped through the button hole, around the button and pulled back through. 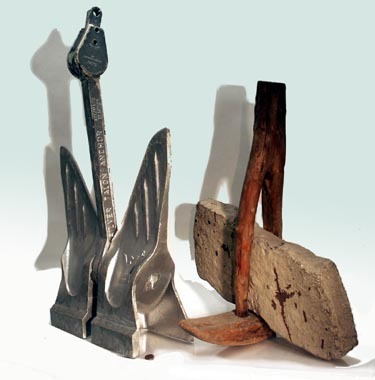 Four variations can be seen here, two in ivory or bone, and both a folding and straight version, distributed by the Davis Hatch Co., Bath, Maine, a local purveyor of foot-ware. 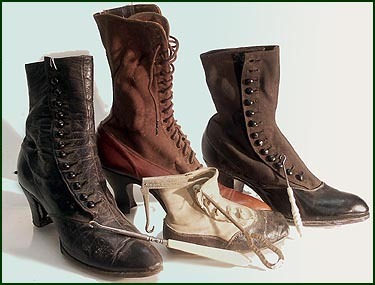 The lengthy lacing of the middle boot was also hastened with such small hooks. Anchor-wise, this nine-foot version is our ultimate hook, excavated during 1970 construction at the site of the former New England Shipbuilding shipyard in South Portland. It weighs about the same as a small pick-up, but grabs the mud considerably better. If you came down with a tooth ache before 1850 in a remote part of the ocean, you likely faced the first mate waving the business end of this device. Known as a tooth key, the hooked end was worked under your bad tooth to then lever it out. Though to our eyes a primitive tool, this one has interchangeable hooks of varying widths, and may have been state-of-the-art for its day. After 1850, state-of-the-art meant the mate would have been brandishing his dental forceps. As with many surviving implement artifacts, the exact way in which it was used has been lost, perhaps mercifully so. 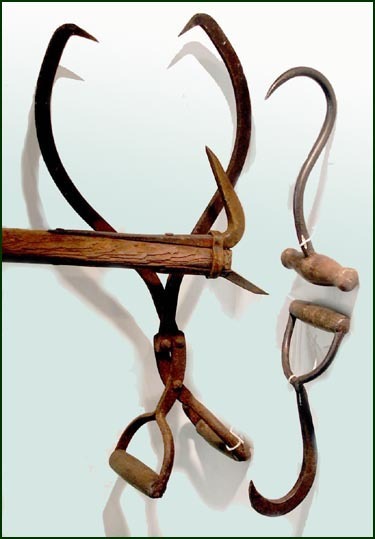 Two hooks with heft (again, note penny for scale): at right a grappling hook of sophisticated design and forging, used in ice houses to pull the blocks up the sluiceways to the entry door; the spurs below the eye imbedded in the ice to keep the hook from twisting free. 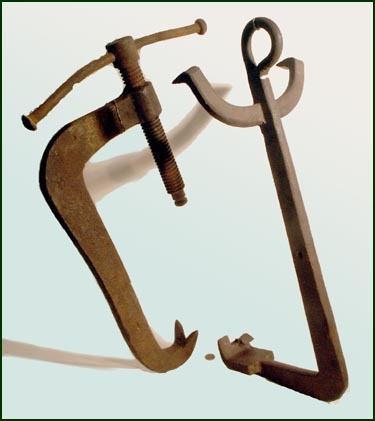 At left is a shipyard clamp with the end split and forged into a double hook to ensure it would not spring loose under an extreme load, as when persuading a steamed two-inch thick garboard to twist the final 1/4" to its appointed position along the keel. Finally, that which only Captain Hook would truly appreciate: a prosthetic substitute for a missing hand, with leather socket and elbow straps. The hook itself is riveted into its mount, and so is not interchangeable, but could possibly be rotated.